Stride Rite® takes its inspiration from a child's out-of-this-world imagination and the challenges of parenting. 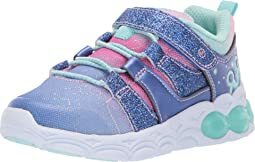 With an eye for innovative, expert-approved designs and on-trend styles, Stride Rite crafts each colorful sneaker and kid-friendly sandal with the understanding that every parents' greatest desire is to provide their kids with the best. 100 years and counting… Time to celebrate! From humble beginnings in a converted stable in Boston, MA. 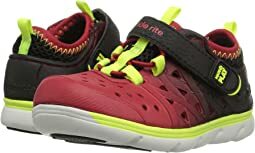 1919, to becoming acknowledged internationally for pioneering innovative styles, Stride Rite has never compromised their goal of providing millions of little ones with the support and stability they need for every developmental stage. Stride Rite may have grown older and larger, but they're still built for childhood and haven't grown up. I ordered 9 extra wide for my almost four year old. They were so narrow. Not even close to getting them on. Contrast with New Balance 9XW sneakers, which fit perfectly. These look amazing. Sad they are so crazy narrow. Have to return. 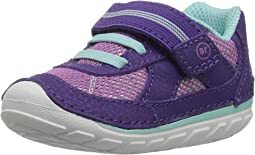 My two year old does really well in these shoes--they have great flex--natural movement, grippy bottoms (for climbing up slides), and a rounded toe to prevent tripping when running. I gave 4 stars comfort only out of speculation because I think he can feel the grippy soles through the bottom--although he doesn't complain. I feel like these are good for his foot growth. Love stride rite soft motion! I always buy these for my little ones from walking age til they outgrow this style. This particular shoe I felt ran small and ended up having to exchange to a half size bigger. Great shoes though! Matches with everything! Love them and love Zappos as well! Thought a 6 1/2 xw would fit my daughter, but they seemed a bit small and her toes were trying to come out of the side. Returned for a size 7 w and they fit much better with some room to grow. Maybe they’ll last a few months. 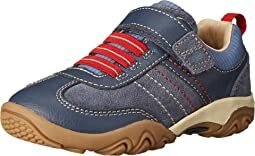 My daughter wears a 10 1/2 in Skechers and these run about to same size, so they fit great and hopefully she can wear them through the summer. 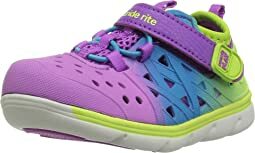 Was so excited about these as Stride rite is usually has good quality products. However after only 3 weeks of average use the are shabby and the material is off the toes. This is ridiculous considering they are “made to play “ and washable. Way too much money spent for these shoes to do this after minimal use in only 3 weeks!! Makes me think twice befire ever buying this brand again. could have use a 2 XW rather than a 2 1/2 Stride Rite seems to run a little large compared to other brands. Wish you had more XW sizes to choose from. They are super cute and my daughter loves them. But it didn't take long to show wear. It's cheap and they are already getting scratched up. She is gentle on shoes and usually other then a little dirty they usually look perfect 6 months later. My daughter loves these shoes. They are cute, comfortable, and match almost anything. These shoes were not as cute in person and we actually quite stiff. I kept them because I figured my 2yo could wear them when playing outside so she wouldn't dirty better shoes. I would not purchase again. 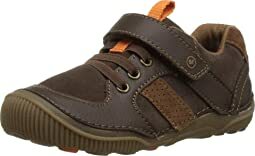 I got these in a 4 W for my 10 month year old who has somewhat square feet and was an early walker. Now she's 14 months old and her feet have grown but we love the shoes so much we're buying her the next size up. We LOVE these sandals! This was the fourth pair of different sandals we tried this spring and these sandals finally checked all the boxes. The bottoms are squishy and padded, the soles are flexible, they don’t rub and they’re adorable! She really likes them. Can play in wet or dry areas. My daughter likes the color of these shoes and how easy they are to put on and take off. These have a really comfortable insole which is a bonus. Based on the size guide measurements, these seem to be true to size and fit perfectly on my daughter’s narrow-medium width foot. These are hands down my daughter's favorite shoes. She always wants to wear them. I wish they had them in larger sizes-I would buy a pair in every size! Adorable shoe for my toddler girl. Love the flower pattern and the beautiful colors! My kid has very wide feet. These were a little tight for him. The New Balance xw shows are more comfortable for him. My daughter asked for shoes that she could wear with dresses at school but also play in at recess. So basically, she wanted pretty mary-janes with a sneaker bottom. Saw these and thought we’d give them a try. She loved them! Wore them to school immediately. No break-in needed (she did wear socks). TTS. Lovely lilac pink color. Great price! Not a good fit for my narrow footed toddler. 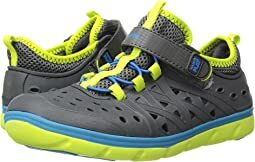 My son loves running, and these running shoes are excellent. 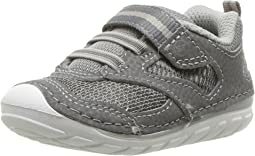 They are easy to put on with the velcro strap being very strong so they don't slip off when he is running. He waded into the ocean a couple of times wearing them, and even then only one of them stopped lighting up. 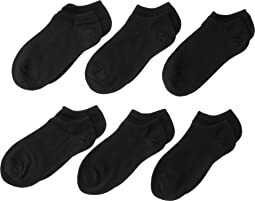 They are easy to clean, and an occasional jump into a puddle didn't get his socks wet. I loved them so much, I ordered another pair next size that he is wearing now, and the next 2 sizes up for when he outgrows these. The price is a little high, but these are the only shoes he is wearing. He wore out the first pair in 6 months, everyday use, about 4-5 miles walk/run per day. 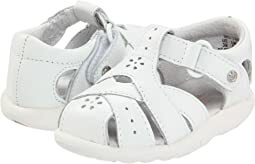 I bought these for my 6-year old who is very hard on shoes. These fit him perfectly and he loved the orange light-up. 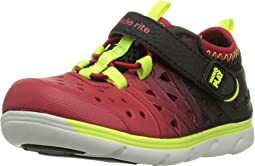 In general I do like and prefer Stride Rite shoes and sneakers and these do not disappoint. I actually think they look even better in person than on-line. Definitely recommend.